Sometimes it’s nice to take a break from writing and remind myself that I have other hobbies. I love making homemade cards and scrapbooks and art journals and other paper crafts. I’ve been making a lot of headway on my WIP, but then I rushed so quickly on I hadn’t thought through some upcoming scenes. I wanted to take a break and let some ideas play in my mind before ironing them out, so I turned my leather desk chair around from the computer to my crafting desk and decided to have some fun. I didn’t want to start any huge projects (they can be messy) so I thought I’d do a series of postcards. 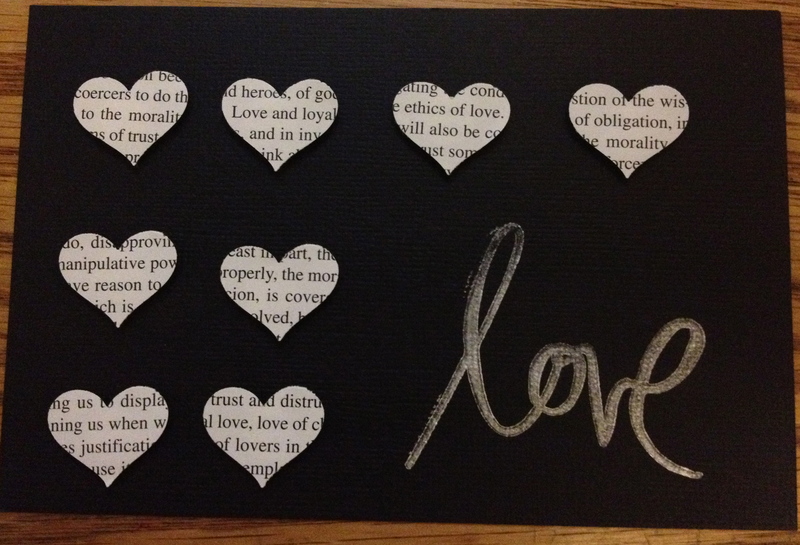 The hearts are cut from an old philosophy textbook. 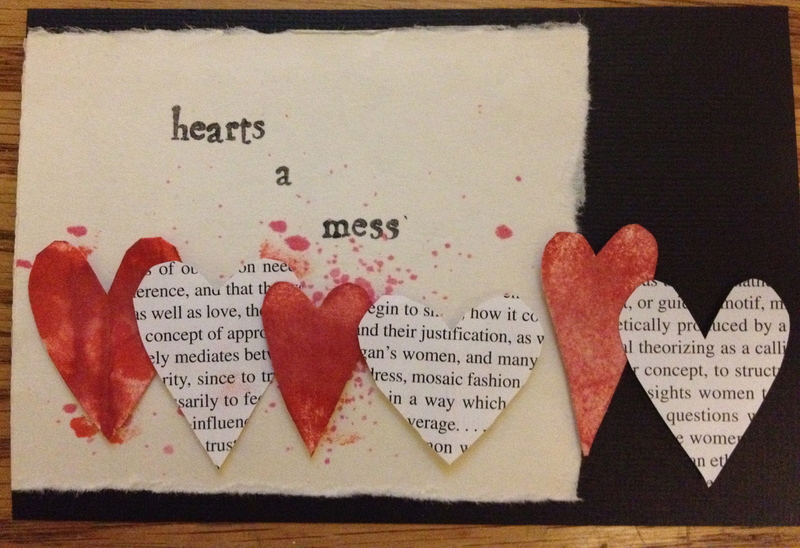 Hearts a Mess is my favorite Gotye song. 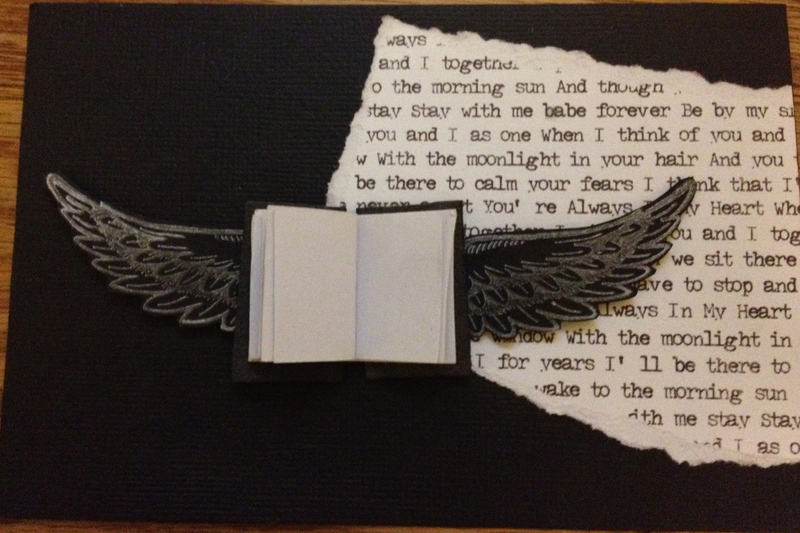 Book with Wings is inspired by Anselm Kiefer’s statue of the same name (I’m kinda obsessed with it). Sometimes breaking out of a writing rut is as easy as exercising creativity in other ways. I’m not a fantastic artist by any standard, but I have fun making stuff. And wouldn’t you know, it did help me mull over the ideas for the scenes I needed to work on at the same time.